Fall seems to be a popular time to celebrate local food with films, dinners and festivals. 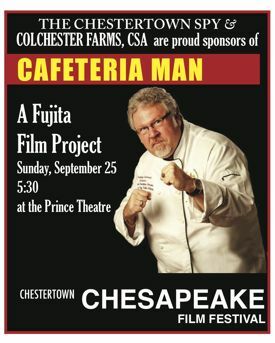 Several events are coming up in the next few weeks which we are involved with and wanted to encourage you to attend: “Cafeteria Man” film and local food tasting at the Prince Theater on Sunday, September 25th, Taste of the Sassafras at Molly’s Inn in Galena on Friday, September 30th, St. Brigid’s Field to Fork Dinner on October 1st, and Turner’s Creek Fall Festival on October 1st. Please see below for more information about some of these events. with a tasting of food prepared with local ingredients prepared by the Kent County Culinary Arts Program. Part of the proceeds of ticket sales will help support Colchester Farm CSA food and education programs. Tickets can either be purchased at the event or pre-purchased online. The event will showcase the best our local restaurants and caterers have to offer. Some of the featured vendors will be Sisters By Chance Catering, Galena’s Kitchen, Twinney’s Place, Sassafras Harbor Cafe, Molly Masons, Crow Farm, Maryland’s Herb Basket, with others still to come. As an added bonus there will be TWO $100 CASH GIVEAWAYS during the event and many raffles and door prizes donated by our member businesses. Come out and enjoy a day of family fun at Turner’s Creek. Activities include pumpkin decorating, scarecrow making, fishing derby, hayrides, Scales & Tales, Apple Butter making, games, demonstration, food and more. Sponsored by the Maryland Park Service, Kent County Parks and Recreation and the Kent Museum. Our eggplants have gotten a second wind. They always seem to thrive in the cooler weather of September, and we have a good crop ready to harvest at the moment. With this change of weather, perhaps many of you are ready to move on to some fall veggies, but I have two delicious recipes to share which I hope you will give a try. They are well-suited to fall weather and make great use of this wonderful vegetable. “Roasted eggplant with tomatoes and mint” is a dish I just had the pleasure of eating this evening. It was recently posted on Smitten Kitchen and can be found here. Drain the chickpeas and put in a pan with enough water to cover. Bring to a boil and simmer for about 1 hour or until tender. Drain. Heat the oil in a large pan. Add the garlic and onions; cook gently, until soft. Add the spices and cook, stirring, for a few seconds. Stir in the eggplant and stir to coat with the spices and onion. Cook for 5 minutes. Add the tomatoes and chickpeas, and season with salt and pepper. Cover and simmer for 20 minutes. To make the garnish, heat the oil in a frying pan and, when very hot, add the sliced onion and garlic. Fry until golden and crisp. Serve the stew with rice, topped with the onion and garlic, and garnished with coriander. While we still have some fresh, flavorsome tomatoes in season, use them instead of canned tomatoes. You will need about 6 large tomatoes. If you are in a hurry, substitute 2 – 14 oz cans of chickpeas for dried. Rinse and drain before adding to the tomato mixture, and cook for about 15 minutes. Welcome back, sunshine and shadows! It feels so good to emerge from the extended wetness of the past month and the winds of the stormier periods. We were far enough East to miss most of the storms; crop loss and damage reports from farms in Pennsylvania, New York and Vermont make us so grateful to see minimal damage in our fields. Farming during that string of rainy days was a challenge. The washer did many loads of muddy work clothes, and we tried to stay focused and positive, getting the harvests in when we needed to, and finding non-fieldwork tasks when we could. You kept going too! Thank you for braving the rainstorms for pick-ups, for the help setting up the tent and loading and unloading the truck, and for the words of support and questions about how we were doing. We had to make decisions about what tasks were okay to do in the rain and which would do more harm than good. We felt the sadness of knowing we were potentially spreading disease through wet tomato leaves, but we would waste so many tomatoes if we left the vines alone, and everybody loves tomatoes, so we harvested anyway. There is a buckwheat summer cover crop in several fields, and the rainy period came just when we needed to mow it to prevent it from going to seed in the field. But mowing was impossible; the tractor might get stuck, and worse, the tires compact the soil when wet. We might see some buckwheat growing as a weed in the future as a result. There were many days it was better for us not even to walk in the fields. So, we cut and stored all the garlic that was hanging up to cure. Walking the fields today, I notice that things look unexpectedly beautiful. The asian greens and mustards are growing quickly in this cooler weather. The thrips that eat at the growing point of the scallions have drowned (or something) so the greens look better than ever. But it’s the craziest thing – to walk around the farm now and see how wild it looks with a few weeks of soil too wet to weed. As the sun dries out the soil, we hope to catch up on some of the field work. Today, with the sun on our backs, we were finally able to weed some of the lettuce mix that is coming in. Even so, it was still too damp to think the weeds might dry out and die in the sun. We carted them in buckets out of the field so they would not re-root and keep growing. Soon it will be dry enough for wheel-hoeing, but for now we hand-weed right around the plants. There is so much to do and sun brings a new energy! If you are feeling that energy too, or if you want to save the little lettuce and baby broccoli from the big bad grasses that out compete them in the wetness, come join us one day! Weeding is good for mindfulness and clearing stress, for uninterrupted conversations, and for your vitamin D absorption. We would love to have you. We will welcome volunteers in these days of weeding. We work from 7 – 12 and from 1 – 4. (Feel free to come for all or part of the day.) To help with weeding, please come on Monday, Wednesday or Thursday. E-mail me before you come to let me know when you’d like to come out.